The NFL announced on Thursday the dates for the three NFL games in London next season. The Lions will play the Atlanta Falcons on Oct. 26 at Wembley Stadium. It had been announced previously that the Lions would be the road team in London, but a specific date had not been set. This means the Lions bye week will be Nov. 2, a good time about midway through the season. Because it’s a road game, the Lions will still play eight games at Ford Field in 2014. In the two other London games the Oakland Raiders will face the Miami Dolphins on Sept. 28 and the Dallas Cowboys will play the Jacksonville Jaguars on Nov. 9. The NFL has been playing regular season games at Wembley since 2007. DETROIT — The Lions will be without starting cornerback Chris Houston who injured his foot in Sunday’s loss to Tampa Bay. Houston had not practiced and was listed as doubtful for this game. Rookie Darius Slay will start for Houston with Rashean Mathis at the other cornerback spot. It's his first start since Week Two. No other surprises among the inactives. For the second game return specialist Micheal Spurlock is inactive. Jeremy Ross will handle the return duties. Other Lions’ inactives: quarterback Kellen Moore, guard Leroy Harris, running back Mikel Leshoure, tackle Corey HIlliard and guard Rodney Austin who was signed from the practice squad on Wednesday. Think there’s a little bad blood between the Lions and Packers? Green Bay guard Josh Sitton slammed the Lions defensive line and coaches on WSSP 1250 in Milwaukee on Tuesday. When Sitton was asked if the Lions would try to take out Aaron Rodgers if he plays, he called the Lions' defensive linemen "dirtbags" and "scumbags" according to the Milwaukee Journal Sentinel. "That starts with their frickin' coach. The head coach, (Jim) Schwartz, he's a (expletive), too. I wouldn't want to play for him. It starts with him and their D-coordinator and D-line coach. They're all just scumbags and so is the D-line." This should make Thursday's game even more intense. 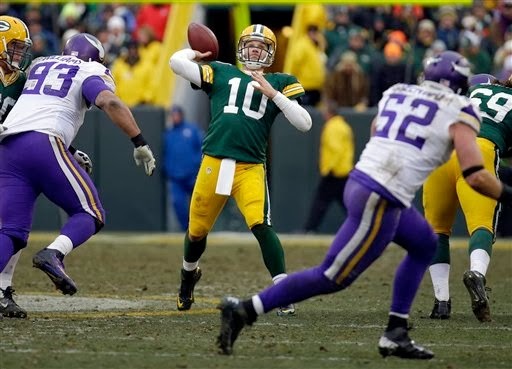 ALLEN PARK — Indications are stronger that Matt Flynn will be the Packers’ starting quarterback on Thursday at Ford Field. 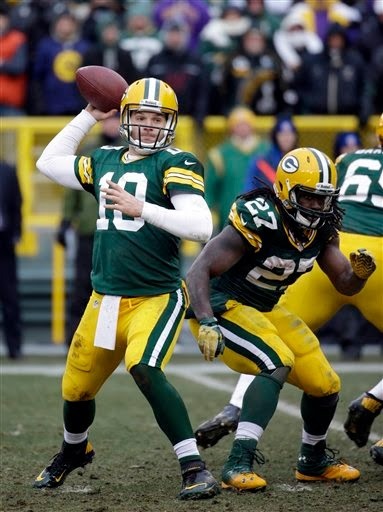 “We had Matt Flynn take the starter reps today that’s the way we’re working it right now,’’ coach Mike McCarthy said in a conference call to the Detroit media about 2:10 p.m. on Tuesday. Aaron Rodgers, who suffered a broken collarbone, did some work at Tuesday’s practice. The Lions (6-5) are atop the NFC North with the Bears (6-5) while the Packers are a half game back. Lions’ safety Louis Delmas called it a “must-win” game today. If you missed the live chat today (Wednesday) on the Lions as they prepare for the Green Bay Packers on Thanksgiving, you're in luck. Here's the transcript. Plenty of concern about the secondary, not too much concern about Packers' starting QB Matt Flynn. ALLEN PARK — Cornerback Chris Houston, who injured his foot on Sunday, did not practice today (Tuesday). Calvin Johnson was on the field stretching, but didn’t participate in the portion of practice open to the media. Travis Lewis, who was not on Monday’s injury report, was also missing. Returning were safety Louis Delmas (knee), defensive end Israel Idonije (knee) and safety Glover Quin (ankle). Following Sunday’s loss, the Lions had a walk-through on Monday. Tuesday was the only full day of practice in preparation for the Thanksgiving game against the Packers. The Lions (6-5) are tied with the Bears (6-5) atop the NFC North. The Packers are a half game back at 5-5-1. 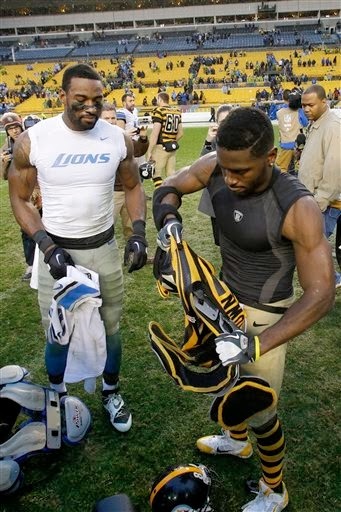 The Lions lost at Green Bay in Week 5 playing without Calvin Johnson and Nate Burleson. Packers coach Mike McCarthy told Green Bay reporters today (Monday) that chances for quarterback Aaron Rodgers to play on Thursday against the Lions at Ford Field are “slim to none.” Rodgers has been sidelined with a broken collarbone. Quarterbacks Matt Flynn and ScottTolzien will prepare, but McCarthy told reporters that Flynn “deserves to start” after his heroics coming off the bench on Sunday to tie the Vikings. He was 21 of 36 for 218 yards and a touchdown. Most Lions fans remember when Flynn lit up the Lions on Jan. 1, 2012, in Green Bay. He finished the day 31 of 44 for 480 yards, six touchdowns, one interception and a 136.4 quarterback rating. The starting Lions’ secondary that day was Alphonso Smith, Eric Wright, Amari Spievey and Chris Harris. Even though Matthew Stafford also had a career day (36 of 59, 520 yards, five touchdowns, two interceptions) on that freezing wet day in Green Bay, the Lions lost 45-41. The Lions (6-5) are tied with the Bears (6-5) atop the NFC North while the Packers (5-5-1) are a half game back. If you've been looking for a youth size Titus Young No. 16 Lions' jersey, you are in luck. The NFLShop.com has them (in small only) for only $69.95. Although if you order by tonight you apparently get 40 percent off. What a deal! All I can say is: Really? Young hasn't played a game for the Lions in more than a year — when he lined up in the wrong spot several times in a loss to the Packers. He's a troubled soul who was released in February and has been arrested in southern California several times since then. After a disappointing 24-21 loss to Tampa Bay on Sunday, all hope is not lost for the Lions (6-5) who are tied atop the NFC North with the Chicago Bears (6-5) who lost 42-21 to the St. Louis Rams. The Green Bay Packers (5-5-1) tied the Vikings so they are a half game back. As Jim Schwartz said after the loss, it's now a five-game season. This sets up quite the Thanksgiving game against the Packers. Basically the Lions have to win. They lost to the Packers at Green Bay early in the season. 1. The secondary has not played well. While the defensive front seven, for the most part, has done its job, the secondary has struggled. Louis Delmas has been up and down. Hard to tell, but it looked like it was Delmas who jumped on an underneath route allowing the 85-yard Bucs touchdown that put them ahead early in the fourth quarter. Chris Houston, who injured his foot on that play on Sunday, has had a rocky stretch. Glover Quin has played most of the season on a bad ankle. At this point in the season there’s not much the Lions can do. There are no Pro Bowl corners sitting on their couch waiting for a phone call. The guys they’ve got must step it up. 2. Receivers have to catch the ball. It’s basic, but it’s not always happening which leads to interceptions which lead to losses. On the Lion’s final drive, Calvin Johnson said he had the ball in his hands, was turning to move upfield and “bang, bang” it was gone. He’s Megatron, he has to hold onto the ball. That wasn’t the first time this season the ball has come off Calvin for an interception. It’s not just him. Drops are a widespread issue. 3. Matthew Stafford has to be more consistent. He could be one of the NFL’s elite quarterbacks, but until the Lions win all the games they should (like Sunday’s) he won’t be put in that class. Clearly all four interceptions were not on him, but he has to make better decisions. The offensive line, for the most part, is keeping him upright. The offense has had six bad quarters and part of that is on Stafford. 4. The defensive line played better on Sunday, putting more pressure on Bucs’ quarterback Mike Glennon than they did against Ben Roethlisberger the week before. Part of it was having Ziggy Ansah return. (He had two sacks which gives him five for the season.) Still early on it looked like Glennon had too much time to get the ball out. 5. Focus. The only important thing is Green Bay because that’s the next game. Prior to Sunday the players and coaches swore they weren’t looking past Tampa Bay, but I wonder. It sounds odd, but several of these players are learning how to win. This is not an excuse just fact. They can not let up on the gas pedal. Remember in 2011 they started 5-0, but finished 5-6. They made it to the playoffs, but the game wasn’t even close. They are more talented this year. They need to prove on every snap how much they want it. ALLEN PARK — No surprises among the inactives for the Lions today against the Tampa Bay Buccaneers. The offense should get a boost with wide receiver Nate Burleson active today for the first time since he broke his forearm on Sept. 24 in a freakish pizza-related accident. Starters defensive end Ezekiel Ansah (ankle) and nickel Bill Bentley (knee) return after missing the last two games. Bentley (knee), Glover Quin (ankle) and Israel Idonije (knee) were all listed as questionable on Friday’s injury report. Lions’ inactives: Wide receiver/returner Michael Spurlock, cornerback Jonte Green, guard Leroy Harris, right tackle Corey Hilliard, running back MIkel Leshoure, defensive end Austen Lane and quarterback Kellen Moore. Inactives for the Bucs: linebacker Mason Foster, guard Carl Nicks, running back Lonnie Pryor, guard Patrick Omameh, defensive tackle Gary Gibson and defensive end Stephen Means. Safety Dashon Goldson is suspended for this game. The Lions will regroup on Monday to prepare to play for the Green Bay Packers on Thanksgiving. With only six games remaining — and two in five days — the Lions need to boost their playoff chances with a win over Tampa Bay at Ford Field on Sunday. 2. Pressure quarterback Mike Glennon early and often. He’s a rookie. Bucs quarterbacks have been sacked 24 times. Enough said. 3. Somehow get back the offensive flow that Matthew Stafford and gang had in the second quarter in Sunday’s loss at Pittsburgh when they scored 27 points. This should be easier with wide receiver Nate Burleson returning from his broken forearm. Also, Bucs’ starting safety Dashon Goldson is suspended for this game which should help open up the passing game for Detroit. 4. Don’t give up big plays. Stop me if you’ve heard this before. These chunk plays have cost the Lions big-time. In every game they’ve given up a touchdown of 30 or more yards. 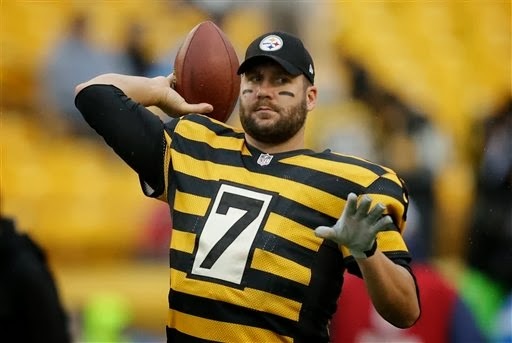 Ben Roethlisberger threw touchdown passes of 34 and 47 yards in the Steelers’ first two possessions. Enough. 5. Aggressive play-calling is swell, but be careful out there. Three points is three points. ALLEN PARK — Louis Delmas was the only player who didn’t participate in Lions’ practice today (Friday). The safety does not usually practice on Fridays or Wednesdays to save his knee for Sundays. All others were at work although at least a few were likely limited. Reggie Bush (knee) has taken the past few Fridays off, but was on the field today. Nate Burleson, who has been cleared to play Sunday, and Bill Bentley had full practice on Thursday for the first time in weeks. The Lions (6-4) are preparing to play the Tampa Bay Bucs (2-8) on Sunday at Ford Field. Then they turn around and play the Green Bay Packers (5-5) on Thanksgiving. ALLEN PARK — In Week 12 it’s almost unbelievable, but the Lions had 100 percent participation in practice today (Thursday). Calvin Johnson (knee), Glover Quin (ankle), Louis Delmas (knee) and Jonte Green (illness) who all were out on Wednesday were back at the outdoor practice in the portion open to the media. It was 43 degrees with a slight drizzle when it started. Ziggy Ansah (ankle) and Bill Bentley (knee) were back at it after practice on Wednesday. Certainly some were limited, but still a good showing with six games left in the season. 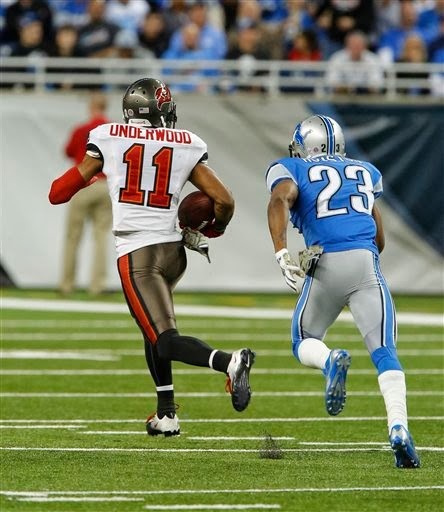 The Lions (6-4) play the Tampa Bay Buccaneers (2-8) on Sunday at Ford Field. ALLEN PARK — Practice looked more like practice on Wednesday with Nate Burleson back working with the Lions’ starters. The Lions wide receiver appears to have a good chance to play on Sunday — his first game since he broke his forearm in two places in a freakish pizza-related accident on Sept. 24. Burleson, 31, did look quick on the practice field. Why wouldn’t he? He has only played in three games this season. He said Sunday will seem like the fourth game of the season for him because it will be. Burleson had a great start this season with three good games — 78, 45 and 116 yards. After three games, he was the Lions’ No. 2 wide receiver. There is no doubt he will have an impact. He has been missed. “We have had to compartmentalize our passing game. 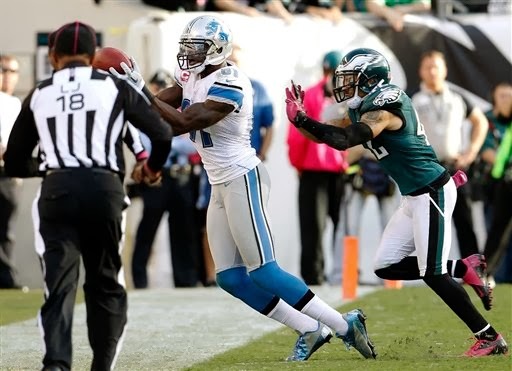 A lot of different guys sort of stepped up,’’ coach Jim Schwartz said. “Not one person replaced Nate’s production. We had a lot of different guys sort of rolling through it. “It will be a big lift when we get him back. He’s on a good track. He’s done more every single time we have gone out to practice. He means an awful lot. We have talked a lot about how much he means to our team and the last time we saw him play in the game, he had the most receiving yards he’s ever had for us as a Lion. It might even have been a career high for him. He can still play at a high level and when we get him back, he’s going to give us those speeds,’’ the coach added. 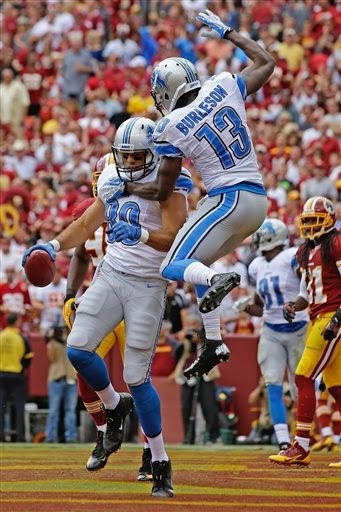 Burleson, who is not quite as humble as Calvin Johnson, knows he can make a difference by being on the field. ALLEN PARK — Safety Glover Quin and running back Joique Bell, who each injured an ankle in Sunday’s loss, did not practice today (Wednesday). Quin, who was wearing an orthopedic boot on his left foot, was on the sideline early in practice talking to defensive coordinator Gunther Cunningham. Bell was out on the field, but not working individual drills with the running backs. Calvin Johnson (knee) and Louis Delmas (knee) didn’t practice, but it’s likely a maintenance day for both. Cornerback Bill Bentley returned to practice for the first time since he injured his knee in the win over the Cowboys on Oct. 27. Ziggy Ansah, who practiced on Friday for the first time but didn’t play Sunday, was back at work. The Lions (6-4) play the Buccaneers (2-8) on Sunday at Ford Field. Nate Burleson is optimistic he will return to action Sunday when the Lions host the Tampa Bay Buccaneers at Ford Field. He's not certain, just hopeful. Burleson was the Lions’ No. 2 wide receiver after the first three games with 19 catches for 239 yards. He broke his left forearm in two places on Sept. 24 and had surgery the next day. 1. Fresh legs. He’s been able to work out his lower body since soon after surgery. Plus he’s not battered and bruised like his teammates. He's practiced for two weeks on a limited basis. 2. Matthew Stafford has developed a comfort level with Burleson over the years that he hasn’t had time to with guys like Kevin Ogletree and Jeremy Ross. 3. Burleson is one of the Lions’ best options out of the slot. He wants to surpass 1,000 receiving yards so he’s got some work to do. It would be difficult but don’t count him out. 4. His energy on the field is contagious. 5. Burleson is one of the offense’s biggest leaders even though he doesn’t wear a captain’s ‘C’. He’s been on the sidelines and around the locker room since the incident which is crucial. But true leaders have to be on the field. He knows that, he’s itching to go. Well, so much for Montell Owens. On Tuesday, the Detroit Lions running back was placed on injured reserve to end his season. The Lions signed him on May 30 mostly to help with special teams. Owens injured his knee during camp and was placed on short-term injured reserve. He started practicing before the bye week (Nov. 3) and played in his first — and only — game this season on Nov. 10. at Chicago. He played just five snaps (two as a fullback, three on special teams) before aggravating his knee injury. To fill his place on the roster the Lions have re-signed tight end Dorin Dickerson. They were short at the tight end position with just Brandon Pettigrew and Joe Fauria on the 53-man roster. Dickerson signed with the Lions on Oct. 15, but then was cut on Oct. 19. He was a seventh-round pick out of Pittsburgh by Houston in 2010. He played in 11 games for the Buffalo Bills in 2012 when he had nine receptions for 117 yards. The Bills released him on Aug. 30. The Lions had worked him out and were familiar with him from coaching him in the 2010 Senior Bowl. 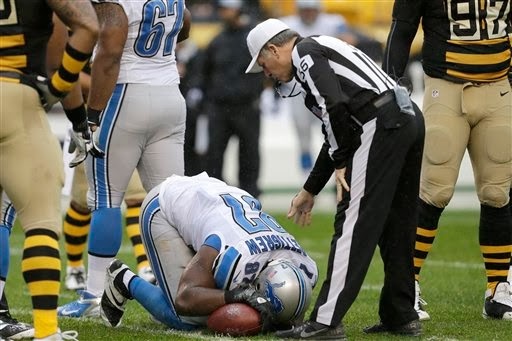 On Sunday, Pettigrew went down (see photo) in the Lions’ first series. He had his left knee wrapped and was able to get back in the game. Fauria was the only other active tight end. In a pinch, Dylan Gandy can fill in on some of the tight end packages. Breaking news: Barry Sanders WAS a mudder. Lions coach Jim Schwartz explained on Monday that Reggie Bush was benched in Sunday’s loss because he’s not at his best running on a wet, sloppy surface. Or in horse-racing lingo, he’s not a mudder. It’s a term that refers to horses who run well on wet, muddy tracks. In fact, Schwartz invoked the name of Barry Sanders saying he probably had the same issues, that he wasn’t a mudder either. Didn’t recall that so I looked it up. In an Associated Press story on Jan. 8, 1992, previewing the NFC Championship game with the Lions playing at the Washington Redskins, Sanders’ skills were discussed regarding the wet field. And if you don’t believe the Associated Press, ask Lions GM Martin Mayhew who was a cornerback for the Redskins in that championship game. Or Wayne Fontes who was the AP NFL coach of the year for that 1991 season. 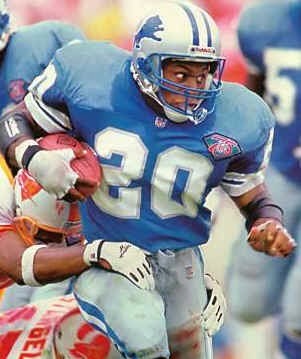 I watched Barry Sanders, a Pro Football Hall of Famer, for season after season. He was a tough mudder. ALLEN PARK — Looking ahead to Sunday when the Lions (6-4) host the Tampa Bay Bucs (2-8) who are riding a two-game win streak. Obviously it’s a huge game for Detroit. The early line has them at 9-point favorites. 1. Nate Burleson could return which should make a huge difference for the offense. When he broke his forearm in a pizza-related accident on Sept. 24 he was the team’s No. 2 wide receiver. He has practiced for two weeks on a limited basis. Last week he ran routes on the scout team. He’s close. My guess is he’ll be back on Sunday. 2. 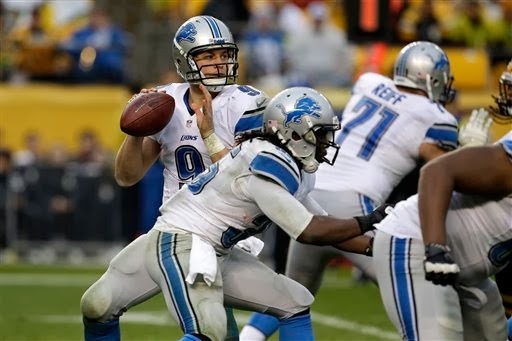 Defensive end Ziggy Ansah tried to return on Sunday at Pittsburgh. He did some pre-game on-field tests and didn’t pass but was close. He’s been out since he rolled his ankle on Oct. 27 in the win over Dallas. If he has a good week, no reason he shouldn’t return. Devin Taylor has been filling in admirably, but Ansah is an upgrade. 3. Look for a regroup. The players are mad at themselves, feel they left too much on the field. They are a better team than the Bucs, they’ll be at home and they definitely need the win after the Bears pulled out an overtime win over the Ravens on Sunday. — Matthew Stafford became the Lions’ franchise all-time leading passer with his 100th career touchdown — a 79-yard pass play to Calvin Johnson early in the second quarter. He surpassed Bobby Layne who is the last Lions’ quarterback to win in Pittsburgh and it was in 1955. ... Stafford was slow out of the gate, but threw for 327 yards and a pair of touchdowns in the first half. Then he was held to 35 yards in the second half when the Lions also had trouble running the ball. — Calvin Johnson had six catches for 179 yards in the first half. That’s an average of 29.8 yards per catch. That is amazing even for a man named Megatron. His 79-yard touchdown reception was remarkable — he couldn’t have been more wide open and Stafford delivered on the money. — DeAndre Levy led all Lions with 12 tackles and two pass defenses. He came so close to his sixth interception of the season even he couldn’t believe it. The linebacker is having an outstanding season. Can’t say enough about him. — Ndamukong Suh didn’t post a stat. No tackles, sacks — no nothing. This happened one game last season too. It doesn’t mean he didn’t have an impact but I would say this was not one of his best games. — For a defensive line that should be setting sack records, once again they came up short. Ben Roethlisberger had been sacked 35 times in the first nine games — that’s almost four times a game. 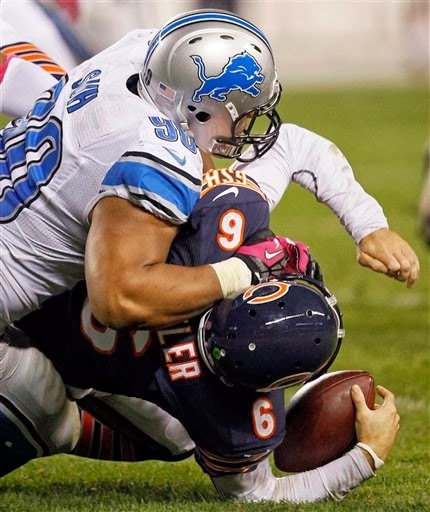 And the Lions only sacked him once and had one quarterback hit — both were by Nick Fairley. Clearly sacks aren’t everything, but this group should be putting more pressure on the quarterback. Big Ben is not a rollover, but other teams have gotten to him quite easily. — Once again too many chunk plays were given up. The Steelers scored touchdowns on 34-yard and 47-yard passes from Roethlisberger to Antonio Brown on the first two possessions. In the 97-yard drive, following the botched fake field goal, they allowed five plays of 10 yards or longer. — The run game struggled. Reggie Bush fumbled and lost the ball in the second quarter which led to a Steelers’ field goal. It was wet but the Steelers didn’t fumble once. Bush had a dozen carries for just 31 yards and two catches for 23 yards. Not a great day for Bush. Joique Bell injured his ankle late but had nine runs for 49 yards and a touchdown. Next up the Lions (6-4) play the Tampa Bay Buccaneers (2-8) at Ford Field on Sunday. The Bucs beat the Falcons 41-28 on Sunday for their second straight win. Wow, how awful is awful? Thought the Lions were playing the Steelers today. But no. It’s the Bumblebees who have taken the field. Those are the Steelers’ throwback jerseys. I'd throw them to the back of the closet. No real surprises among the Lions’ inactives today at Pittsburgh. Wide receiver Calvin Johnson is a go as expected. He missed practice on Wednesday and Thursday and was limited on Friday. Ezekiel Ansah misses his second straight game today. The defensive end rolled his ankle in the Dallas game on Oct. 27. He practiced on a limited basis on Friday — it was his first appearance on the practice field since the injury. Rookie Devin Taylor will get his second straight start at right defensive end. Also inactive are wide receiver Nate Burleson and cornerback Bill Bentley. Both were doubtful on Friday’s injury report. Burleson is getting closer to a return after breaking his left forearm on Sept. 24. He has practiced on a limited basis for two weeks. He ran routes for the first time starting on Wednesday. Bentley has not practiced since injuring his knee in the win over the Cowboys on Oct. 27. Don Carey will start at nickel while Rashean Mathis will start at cornerback opposite Chris Houston. Running back Montell Owens was listed as out on Friday. Running back Mikel Leshoure is active today, but wouldn't expect him to play much of a role on offense. Rookie LaAdrian Waddle starts for second straight game at right tackle, as expected. Other Lions’ inactives: Right tackle Corey Hilliard, offensive lineman Leroy Harris and quarterback Kellen Moore. The Lions (6-3), looking for their third straight win, face the Steelers (3-6) at Pittsburgh. They haven’t won in the Steel City since 1955 when Bobby Layne was quarterback. 1. Pressure quarterback Ben Roethlisberger. It shouldn’t be too difficult, he has been sacked 35 times in the first nine games. The veteran quarterback doesn’t like to give up on a play and he doesn’t get the best protection from his offensive line. 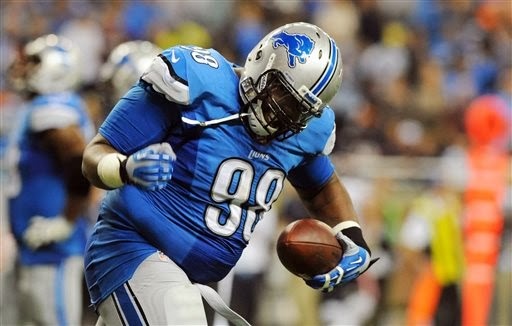 Facing Ndamukong Suh and Nick Fairley could spell trouble. He knows he has to be careful or — as he said it — he’ll be dead. 2. Run the ball effectively against the Steelers’ rush defense which is ranked 29th in the NFL. Reggie Bush said from watching film he thinks the key against the Steelers is to break through arm tackles. Bush had his second 100-yard rushing game this season on Sunday — both came against the Bears. 3. Prevent the big play. It’s a broken record, but these chunk plays have killed the Lions. In each of the nine games they’ve given up a touchdown play of 30 or more yards — three of them were 78 yards or more. Seriously, too much. The secondary has to make better adjustments. 4. Steelers coach Mike Tomlin showed utmost respect for Calvin, calling him Mr. Johnson during a conference call this week. Well, Mr. Johnson and Mr. Stafford may have to work harder this week to make the passing game effective against a sound Steelers’ secondary. The Lions will likely be without Nate Burleson (forearm) but Stafford has been able to make connections with Kris Durham, Jeremy Ross and Kevin Ogletree in Burleson’s absence. 5. Play hungry. Lions players are admitting that in 2011, after they started 5-0, they weren’t playing as hungry as they should have been. They finished the season 5-6 for a 10-6 overall record. They made it to the playoffs and lost to the Saints. They are hungrier now. They’ve learned a little about winning. They can’t see a team struggling with a 3-6 record and think winning will come easy. It won’t. ALLEN PARK — Calvin Johnson and Ezekiel Ansah returned to Lions’ practice today (Friday). It’s the first practice for Ansah since he rolled his ankle in the win over Dallas on Oct. 27. It’s unclear if the starting defensive end will be ready to play on Sunday at Pittsburgh. Johnson did not practice on Wednesday or Thursday, but said on Thursday that he expects to play Sunday. He’s been nursing a knee injury since early in the season. Cornerback Bill Bentley (knee) and Montell Owens (knee) remain out. They haven’t practiced at all this week which makes it unlikely they will play on Sunday. Reggie Bush (knee) and Louis Delmas (knee) didn’t practice on Friday. The safety usually practices only on Thursdays to save his knee for Sundays. Bush has not practiced the last two Fridays and still played on Sunday. The Lions (6-3) play at the Steelers (3-6) on Sunday. ALLEN PARK — My how things change. In the not-so-distant past, the Detroit Lions were consistently the patsies. Now, with a 6-3 record and a bruiser of a defensive tackle named Ndamukong Suh and his sidekick Nick Fairley, that has all changed. The Lions play at the Steelers (3-6) on Sunday. Pittsburgh wide receiver Emmanuel Sanders told the Pittsburgh Tribune-Review that the Steelers won’t roll over. “We're definitely not going to get bullied. That's not going to happen around here. Nobody is going to bully no one around here,’’ Sanders told the paper.